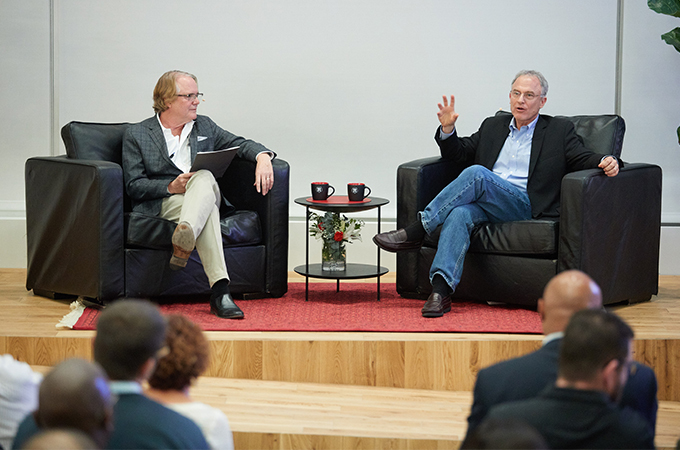 On November 15, the University of Redlands’ 21st Century Leadership Speaker series featured TripAdvisor CEO Stephen Kaufer, who shared the lessons he has learned on entrepreneurship, management, and marketing over the course of founding and growing the company into an internet powerhouse. “Steve is obviously legendary for founding TripAdvisor and affecting the nature of travel and the way we think about it,” said U of R School of Business Dean Thomas Horan, who engaged Kaufer in conversation as part of the night’s presentation at the school’s location at WeWork’s downtown Los Angeles Gas Company Tower. Kaufer began with an anecdote about the early beginnings of TripAdvisor, describing the difficulties he and his wife faced in planning a vacation to Mexico in 1998. In the early days of the internet, Kaufer consulted a travel agent, who left him with an array of resort brochures and little guidance. After returning from the trip and thinking about its laborious planning process, Kaufer parlayed his frustration into action. Originally, Kaufer and his small team attempted to market and license this travel search engine to companies and websites. When that proved unsuccessful, the team changed TripAdvisor from a business-to-business model into a business-to-consumer model, introduced forums for customer reviews, and placed hotel ads on its webpages to generate revenue per click. With this new model, Kaufer struck internet gold—the website now has 700 million user-written reviews of hotels, restaurants, and activities. The success hasn’t come without its share of challenges, though. Hotels and restaurants didn’t take kindly to the fact that the website was constantly publishing unverified reviews written by occasionally disgruntled guests. This feeling took years to overcome and led to allowing establishments to respond to these customers within the TripAdvisor forums for free. Later in the conversation, Horan asked Kaufer about his management and marketing practices, specifically his mentality of “hiring slow and firing fast.” Urging hiring managers to pay close attention to their job candidates, he advised them not to be fooled by a candidate’s impressive resume. For the TripAdvisor logo, Kaufer noted that the company needed something distinctive—since owls are always looking and can see in the dark, they made sense for the company. While TripAdvisor first relied on the purchase of Google search terms to get the word out, when other competitors began making commercials Kaufer decided to modify the original strategy. The company is now on track to spend upwards of $100 million on commercials this year alone. Throughout his years of experience, Kaufer has seen the ways that TripAdvisor has changed the travel industry. In addition to raising the overall satisfaction level of travelers during their vacations, the company has also leveled the playing field between large, global hotel brands and independent hotels and bed and breakfast establishments. Kaufer also founded the TripAdvisor Charitable Foundation, which has raised millions of dollars to aid various humanitarian crises. Learn more about the University of Redlands School of Business, its Purposeful Leadership Initiative, and the 21st Century Leadership Speakers Series.